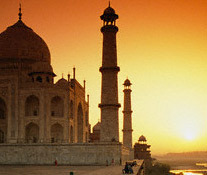 The short tour to Taj Mahal is probably the largest in terms of the legends, heritage, glory and beauty of the white tomb. For some, it is poetry in marble; for some, it is a tear drop on the cheek of time or for others, it is an ode and a celebration for true love. On the way to Taj Mahal, some other important places are covered including Mathura - the birthplace of Lord Krishna, Sikandra Fort, Agra Fort and Itmad-ud-Daula, besides Delhi�s sightseeing. Arrive at Delhi. Meet and assist at the airport then transfer to the hotel for overnight stay. Morning drive Delhi to Agra, the city of Taj which is 203 kms. & approx. 04 hrs. drive. Enroute visit to the Mathura Temples and Sikandra Fort. Upon arrival transfer to hotel. Overnight in Agra. 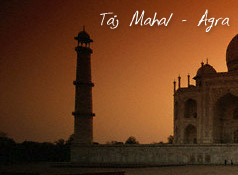 Morning, proceed for sight seeing tour of Agra visiting the world famous Taj Mahal, Agra Fort and Itmad-ud-Daula. Later drive back to International Delhi Airport to board the flight to onward destination.